Greetings from Marble Canyon, Arizona. It's Earth Day. It's also Susan Kliewer's birthday. We've been having quite a party here since our arrival at 6 pm Friday evening. This morning a neighbor pronounced, "This is the biggest and best party we've sene in this town in years." The "this town" to which he referred is a fly spleck place called Vermilion Cliffs. It's there's 50 people who live here that's probably an exaggeration. Clayton, Idaho, loves its little highway sign that says Population 26. Heck, Clayton actually has an extended population of over 1,000 people up there in East Fork Country. Well, Vermilion Cliffs might have 50 people and there is no such thing as an "extended population." Marble Canyon is the official US Post Office. Marble can't possibly count 20 permanent residents. Down the road a piece there's a place called Cliff Dwellers. They probably can't count 15 people who lives there. That makes Vermilion Cliffs the main "town" in this neck of no woods. There's not a tree in sight here. It's a Desert Lover's Desert. Even the sage runs scared here and barely grows knee high. Rabbits arefew and far between because there's nothing for them to eat. Even the pack rats have to pack their grub stake on their back when they pass through these parts. Dry is a way of life here in Marble Canyon. It's ironic that the mighty Colorado River runs full and free deep in Marble Canyon a mile or two away. It wouldn't be possile to get any water out of it even if it was legal to do so. The Californians long ago laid claim to every drop of that big river. Even though they can't drink it, the people of Marble Canyon Country make their living from the Colorado River. Yep, everyone one of them survives because of life-giving waters of the fabled river. Most of the lives of people here revolve around making money from river runners, trout fishermen and tourists passing through on the way to or from the Grand Canyon. The COlorado River is like a giant magnet for money. People pay thousands of dollars for a river trip and hundreds of dollars to catch big, fat fish who prowl the cold, dim eddies of the tail waters of Glen Canyon Dam a few miles upstream from legendary Lees Ferry. You've all heard of Lees Ferry. It is to the Southwest what Grand Central Station is to New York City. Life as we know it here sincethe white people showed up has revolved around Lees Ferry. Not far away up here in Marble Canyon, that's where a few hardy people hang out and harvest dollars from river runners, fishermen and the ever-present pipeline of tourists. Susan Kliewer worked as a waitress at Marble Canyon Lodge from 1974-1979. She fell in love with the place. Uncounted thousands of people fall in love with this place but they don't stay. They move on down the road. 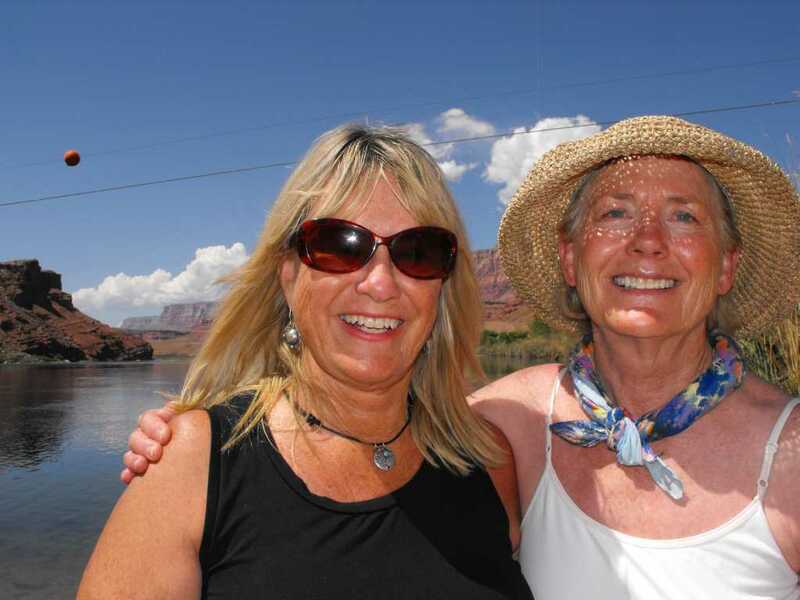 Susan moved on but her heart stayed here, deeply in love with Marble Canyon. As soon as she could, she bought a house in Vermilion Cliffs and has continued to carry on her affair with the landscape here. Friday night when we showed up, we started reading "Finding Evertt Reuss" by Dave Roberts. If you know The Cult of Reuss, you know why it's perfectly poetic to read Ruess here. Well, imagine this: When Susan was a toddler her grandmother had a first edition copy of "A Vagabond for Beauty" on her coffee table. Little Susan fell in love with Everett at the tender age of 5 years. Everett became her hero then and continues in her pantheon of heroes today. This whole country is interwoven with the Life and Times of Evertt Reuss. It's aways sunch a delightful interlude to layover here at Susan's Place in Vermilion Cliffs. We partied into the dark skies Friday night. We spent almost 6 hours roaming the truly deserted nooks and crannies of House Rock Valley yesterday while a half dozen endangered condors soared overhead. We hiked back into a mysterious spring that would have made Evertt's heart leap for joy. We used our GPS to drive to the invisible Utah Line that only high tech satellites can see. Once again everyone got their Party Faces on and the mirth and merriment continued well past midnight. As people leave other partiers arrive. The party goes on. Susan's 72 but her Party Self seems to be a mere 27 years old. Laughter is the rule of the party. Laughter rolls live waves over the old sandstone homestead. Fat collared lizard sit on the wrinkled cottonwood bark and cast a wary eye as the party rolls on. We haven't been down to the river yet. There's too much current and flow happening here to bother going there. Oh, for sure, we will take our obligatory pilgramage to wiggle our toes in the Colorado River. In the meantime, all the action's happening here at Vermilion Cliffs. It's Earth Day and Susan's Birthday. What more can we ask? Postscript Note: Sunday and Monday kind of blended into a pleasant blur of memories as well. What a great place. THANKS, Susan & Jeff for your awesome hospitality and kindness.